Should You Have a Neck Knife? 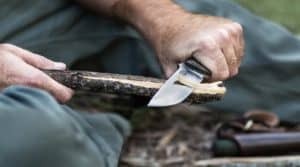 One of the trendiest new-ish items in the survivalist community is the neck knife. Small and lightweight, these knives are designed to be worn around the neck like a necklace. But they aren’t without controversy. Some love neck knives and others think they are flat-out idiotic. Here’s the unbiased scoop on neck knives to see whether it is worth it to get one! This varies depending on the type of sheath and how you wear it, but neck knives can be very easy to access. Someone strangling you? Your neck knife will be right there where you need it. It is really easy to spot a sheathed knife on your waistband. Sure, you can wear a sheathed or folder knife tied to a leash inside your waistband, but this is pretty uncomfortable. By comparison, a neck knife is very easy to conceal underneath your shirt or jacket. Neck knives aren’t just short in regards to length, but they also are very slim in their thickness. I know a lot of people who bought neck knives to wear on their hip because they were the smallest option. As I talk about in this post about how to choose a knife, fixed-blade knives are stronger than folding knives. If you are looking for a strong-yet-compact knife, a neck knife might be your best option. What’s better than one knife? How about two! Some people carry their extra knife on their leg, but the neck is another option. Or maybe you want to go for the hip, leg, and neck so you have three knives as part of your everyday carry. 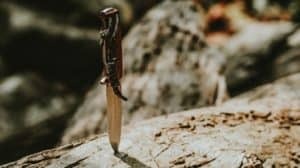 This might seem obvious or funny, but there are a lot of situations where you might need to wear a knife without pants on. For example, if you are swimming, you probably don’t have a good way of wearing your knife on your swimming trunks. Likewise, women often wear pants without any belt loops (like yoga pants or stretch pants). My Bug Out Bag has hip straps on it, as do my backpacks for when I go wilderness trekking. I’ve found that the hip straps can get in the way of my belt and make it difficult to get my knife out. Also, the hip straps can push against the knife and be really uncomfortable. A neck knife is a good solution to these problems. Accessing a neck knife isn’t always easy. Let’s say that someone is strangling you but your neck knife is underneath your shirt. Good luck getting it out! Likewise, some neck knives are very awkward to remove from the sheath and you might need a 2 hands to deploy. 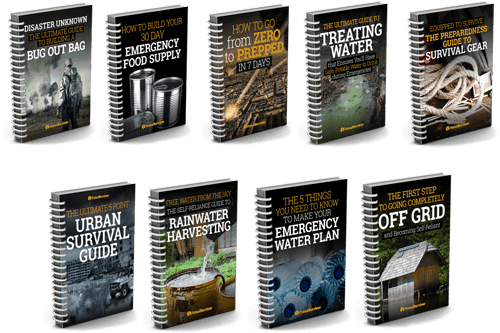 This is not something you want in emergency situations! 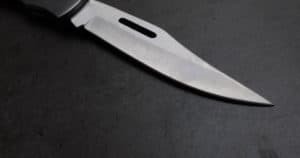 Yep, your neck knife might be illegal depending on where you live. Wearing anything around your neck can be a choking hazard. Thus, if you are going to wear a neck knife, it is smart to use a breakaway chain for safety reasons. Plus, the breakaway chain means you’ll be able to tear the entire knife off your neck for easier access if necessary. Neck knives can also be a safety hazard if you fall on them. Do you really want a razor-sharp knife just inches away from your heart and lungs? If the sheath is low-quality, this could mean a deathly stab wound during a fall! If the sheath or chain fails, your neck knife is going to fall out. If you don’t notice, you’ll lose your knife. If you do notice, then you might embarrassingly have to scramble around the supermarket floor looking for it. The newest generations of neck knives are a lot better than the older ones. Those older ones were really heavy and started to be uncomfortable after just 30 minutes of wearing them. If you aren’t used to wearing a necklace, then you might find any neck knife – regardless of weight – to be uncomfortable. When worn outside of your shirt (or without a shirt at all), the neck knife will bounce around a lot. It is particularly annoying when you’ve got to crawl around on your stomach. I’ve also found that the neck knife is rarely in a convenient deployment position because it bounces around on the chain. The solution is to wear it under your shirt, but then it isn’t easily accessible anymore. Now you know the pros and cons lets have a look at some of the top knives on the market right now. A good cheap option for those looking to try a neck knife for the first time. It is not a super high quality knife but is very usable for everyday carry. 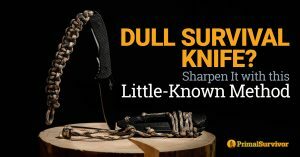 It weighs in at a very light 1.5 oz and comes with a safety ball chain and sheath. This is a mid range knife that comes with a Zytel sheaf and fixed bowie blade. 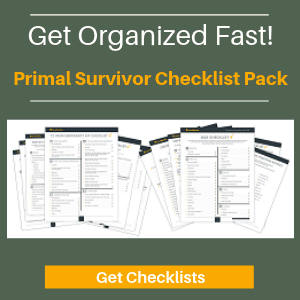 It weighs an impressive 1.6 oz and is generally well regarded by survivalists. This is the Rolls-Royce of neck knives. They are hand made and razor sharp. Extremely light at just 2.5 oz with sheaf. Also included is a paracord neck lanyard and breakaway clasp. Made in the USA and comes with a lifetime satisfaction guarantee. Should You Get a Neck Knife? Just like there is no one “perfect” knife, there is no one answer to this question. I personally prefer my fixed-blade hip-carry knives, but also love my neck knife for certain situations – like when swimming or wearing a heavy backpack with hip straps. 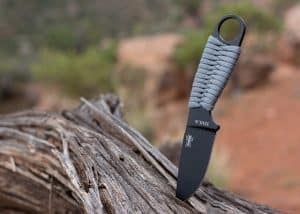 The sheath MUST be good quality: If the sheath isn’t good quality, the neck knife could end up stabbing you during a fall! It should require a very strong pull to get the neck knife out. Aim for 2 oz. or less: Anything heavier than this will be very uncomfortable to wear. Get a breakaway chain or cord: Ball chains are breakaway, meaning you won’t get strangled by your neck knife if it gets snagged on something. Some people find ball chains to be uncomfortable, so you could consider a leather or paracord strap with a breakaway clasp. Check your local concealed carry laws: You don’t want to end up paying a fine because of your neck knife! What’s your take on neck knives – love ‘em or hate ‘em? Let us know in the comments. I have worn one for 40 years.. At first you wonder.. what to use it for.. But as time goes on… You find you use it for everything you need a sharp edge for.. And can’t imagine getting dressed and not putting it on..
Yep – surprisingly useful tool.